The research questions were straightforward; how to help pedagogical experts to understand the aims, means, and methods of the game experts? 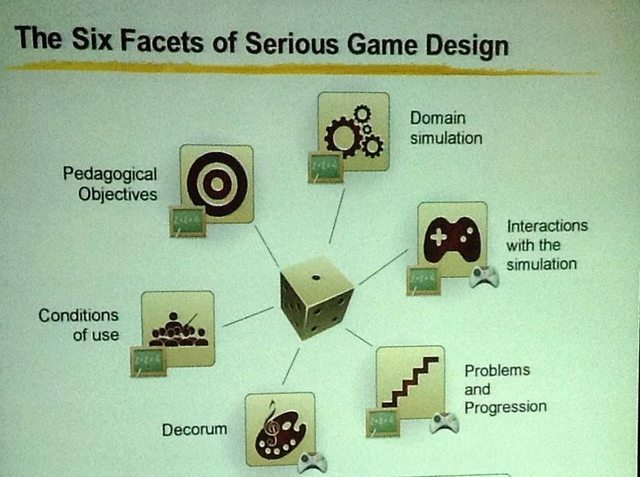 On the other hand, how to help game experts to understand the aims, means, and methods of the pedagogical experts? How do you get both stakeholders to speak the same language during the design of a serious game? To answer these questions, a conceptual framework was built that explains six facets of serious game design. The six facets include: pedagogical objectives, domain simulation, conditions of use, interactions with the simulation & problems and progression. Why does this conceptual framework foster collaboration? Because, first of all, the language of the design patterns is formalized. This language describes solutions to recurrent problems. Second, the framework offers a set of common best practices, indexed into a pattern language to be found easily. A formalized language supposedly bridges the gap between both types of experts. The design patterns that were subsequently collected come from the domains of ITS (no game design aspects), Games (no pedagogical aspects) and Serious Games (which mix fun and pedagogy). Existing DP’s (Design Patterns) were organized into a new conceptual framework. For example, the pattern ‘problems and progression’. How does a learner become more aware of his or her acquired knowledge? How to give feedback and allow the player to stay in a state of flow? How to use feedback to enhance motivation? A solution to this problem might be: represent items of knowledge or skills with virutal objects to be collected. Such as in game rewards, experience points, badges and medals. Another example that comes form a problem. How can one teach high-level knowledge? Because, within a game, it is difficult to concentrate on the interactions of the game while being engrossed in high-level thinking at the same time. Design solution: define 2 phases, the intensive action: the is a phase for practice and learning, and the reflective phase: a phase for thought and reflection. This phase is usually less intensive. The method of debriefing works well: as a player, you return to what has happened during the action.